Are black electric radiators less efficient? Our range of black electric radiators are manufactured with high-quality components and constructed to a premium standard. The colour of your electric radiator will make no appreciable difference to its performance. When it comes to heating efficiency, the material used to construct the radiator body is much more significant than the colour of its finish. In our radiator ranges, colour really is only skin deep: beneath their powder coating, you will find the same aluminium or steel frame. For specific information about the efficiency of a product, refer to the relevant product page. The number of radiators required for adequate heating depends on a number of variables within your home. From the size of your room to the level of insulation, these things all have an impact on the number of electric radiators you will need to provide heat in your home. Choosing an electric radiator with the correct wattage is key to achieving your desired coverage. Wattage is a measurement of electrical power and all electric items have a wattage output. For electric heating, the best approach is to combine several radiators together to effectively heat a room. This way, your electric radiators won’t have to operate at maximum capacity to achieve warmth. This can help sustain the life of your product and avoid expensive energy bills. To determine how many electric radiators you need to heat your space, you can use our helpful wattage calculator. This calculator takes into consideration factors like room dimensions and insulation and provides you with a total wattage needed to heat that room. You can then purchase radiators that meet and exceed that total wattage to know that you will be providing enough power for adequate heating. If you need any more assistance when considering how many radiators to use in your home, one of our dedicated sales advisors is always on hand to provide additional help. Can I DIY install my black electric radiator? Many of our electric radiators are suitable for DIY installation and can be installed with the bare minimum of DIY knowledge. For many of our products, a few holes for the mounting brackets and a few screws for the radiator is all that’s needed. Whilst many of our products are suitable for DIY installation, for specific installation information please refer to the individual product pages. When DIY installing is not an option, a certified electrician will have no trouble installing your electric radiator and can provide a hardwire finish for a tidier fit. 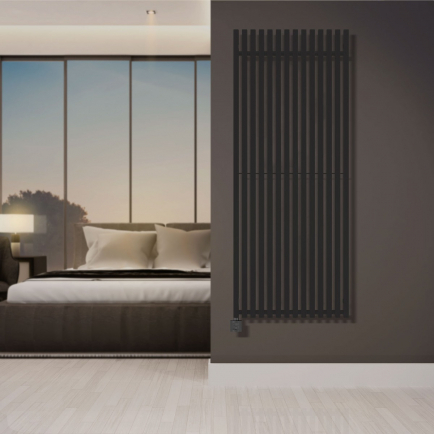 At Electric Radiators Direct, we understand the aesthetic implications of choosing the perfect electric radiator for your home. If you’re tired of traditional white appliances dominating your household, why not take a look at our impressive selection of black electric radiators that combine high-quality components with refined and elegant designs. Whether you’re making a bold design statement or simply want to add a touch of grandeur to your home, we have an array of styles, sizes, and wattages to choose from. Whatever your exact requirements, our range of black electric radiators provides a timeless and elegant finishing touch that adds sophistication without compromising on efficiency.